Cerebral Stroke is classified into two major types - Hemorrhagic and Ischemic. Occur due to rupture of a cerebral blood vessel that causes bleeding into or around the brain. Account for ~ 16% of all strokes. Further divided into Two major categories, one is Intracerebral hemorrhage is the most common. Second is Subarachnoid hemorrhage, due to rupture of a cerebral aneurysm. Caused by blockage of blood flow in a major cerebral blood vessel due to a blood clot. Account for ~ 84% of all strokes. Further divided depending up on their etiology into several different categories including thrombotic strokes, embolic strokes, lacunar strokes and hypoperfusion infarctions. Both may mimic each other clinically. Role of imaging is diagnosis as early as possible with as much as close to the etiology. First of all it is important to mention that these group of pts are highly non co operative so every imaging step should be short and aim oriented. Modifications in imaging protocol and sequences to be done as per the case, most important factors are time with sensitivity n specificity of particular modality or a sequence for that particular condition. CT is the preferred initial choice. Non contrast routine CT is sufficient to rule out bleed which is an absolute contraindication for thrombolytic therapy used in ischemic strokes. A hypertensive bleed is typical for site with history of hypertension / on admission high blood pressure. 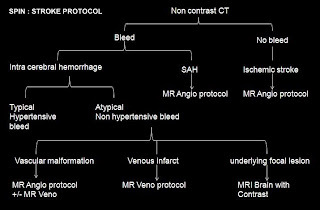 If bleed is in non hypertensive or atypical, look for any associated abnormality as a cause of bleed which may require MRI with aim oriented sequences like MRI Brain Angio protocol (Diffusion, FLAIR with non contrast 3D TOF for brain Angio and 2D TOF for neck Angio) to look for any Aneurysm, AVM or MRI Veno protocol (Diffusion, FLAIR, T2*GRE with non contrast 2D TOF for brain venogram) for venous infarct. Causes of non hypertensive hemorrhagic stroke include hemorrhagic venous infarct, Amyloid angiopathy, Vascular malformation, Coagulopathy, Hemorrhage into a tumor, Drug abuse, etc. 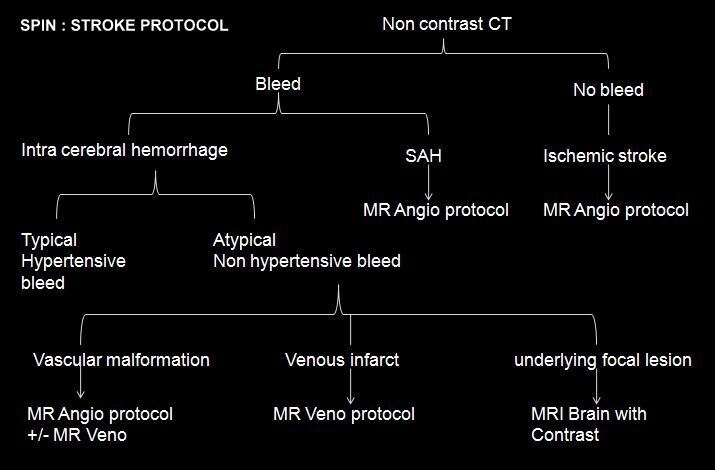 If there is no bleed on CT, go for MR Angio protocol to rule out acute ischemic stroke that was not obvious on CT.
MR Angio protocol - Diffusion, FLAIR, NC 3D TOF for Brain Angio and 2D TOF for Neck Angio. MR Veno protocol - Diffusion, FLAIR, T2*GRE, NC 2D TOF for Brain veno. What should raise the suspicion for atypical bleed and encourage for further evaluation ? Previous clinical and treatment details. Discrepancy in imaging wise age of hematoma and as per history. Resolution pattern of hematoma, fluid - fluid level. Perilesional odema disportionate to amount bleed. Any soft tissue density in or adjacent to hematoma. Any vascular malformation in or adjacent to hematoma.